... a lot of you have owned Nintendo systems over the years. 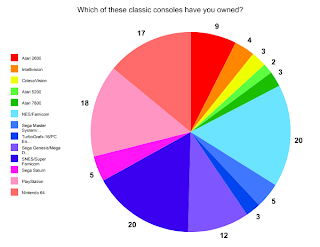 I was a bit shocked to see the Genesis/Mega Drive get so much love (12 "votes") and saddened (but not surprised) to see the Sega Saturn and especially the TurboGrafx-16/PC Engine be all but ignored. Anyway, a new poll/survey will be up in a jiffy. Thanks as always for sharing your thoughts! Much expected. I played TG16 when I was young, but only because a neighbor kid had it. Same with Sega Genesis until we bought one ten years later for $6 at a garage sale (3 controllers, 12 games...it was a steal!). Yeah, I was "that kid," just like your friend, when I was young -- meaning, I was the one kind who owned and actually liked the TG16. I'm like you when it comes to the Genesis, though -- I didn't own one until well after that generation ended.